There are some phrases or lines we are often drawn to as writers, like a fly to flypaper, or in the case of some writers, like a lonely sheep to its flock. “Quacks abound like Locusts in Egypt” is one such phrase. This phrase was coined by an early Colonial historian for the New York, William Smith. In 1757 Smith wrote a fairly extensive book reviewing the benefits of the Colonies and Provinces in this part of the New World. 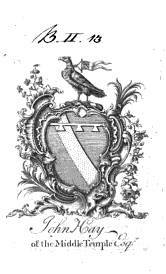 This book was entitled THE HISTORY Of the PROVINCE of N E W-Y O R K, FROM THE First Discovery to the Year MDCCXXXII. To which is annexed, A Description of the Country, with a short Account of the Inhabitants, their Trade, Religious and Political State, and the Constitution of the Courts of Justice in that Colony. According to the subscript this book was Printed for Thomas Wilcox, Bookseller at Virgil’s Head, opposite the New Church in the Strand, in London. This printing was dated ‘M.DCC.LVII.’ (1757). I Beg Your favourable Acceptance of this short Account of the ancient and present State of the Province of New-York. It is not presented for Your Lordship’s Information.—All the World knows, that the Affairs of the British Colonies, have been, for several Years past, under Your principal Direction and the Wisdom of the Measures pursued for their Prosperity and Defence, are indisputable Arguments of Your Acquaintance with their Condition. Nor am I induced to inscribe these Pages to Your Lordship, by Interest the common Motive to Addresses of this Kind.—Being therefore uninfluenced by the Principle, I shall not follow the Example of Dedicators ; but suppress those Sentiments concerning Your Lordship, which would, nevertheless, give Offence only to Yourself, and to those who envy Your Talents and Your Virtues, and are Enemies to their Effects, Your Reputation and Your Power. My Lord, Your ardent Attention to the American Plantations, and assiduous Labours for their Protection and Growth, have laid us under the most indispensible Obligations to Gratitude. At least one new version of this book followed its initial publication. Portions of this book were published in parts by various journals circulated, mostly in Europe. A number of important cultural topics often cited quotes from this book. One of the more commonly quoted sections of this book was the description of New York city life. Published just one year after the Stamp Tax Act took effect in 1756, certain parts of Smith’s writings were about the time when Cadwallader Colden was Governor of New York. Some of Smith’s claims were even taken as criticisms by Colden, leading Colden to write several letters to Smith contesting his claims. None of Smith’s claims or the news about Colden’s letter to Smith were politically important enough to survive as a part of the long term knowledge that persisted about the book itself. Smith statements about Colden’s progress certainly had an impact on the local history. Smith’s writings about the Iroquois versus Colden’s writings of the Iroquois were once a topic of the intellectual arguments between these two writers. Smith, like Colden, was a Loyalist, whose claims about New York history may have been overly biased culturally due to this loyalism. According to Smith, a doctor trained in England is by default much better than any physician trained in the Colonies, since no schools or forms of government control of licensure existed. Even more suggestive of Smith’s self-absorbing ethnocentricity related to the local medical society that had formed in the New York City area. Seven years before Smith’s book was published, Samuel Bard had already taken significant steps in dealing with this professional and political problem, by initiating a society amongst his Doctor friends and having the first medical “journal” (more a newsletter) published beginning in 1750. Smith never acknowleges any of this work or progress in the medical field by Bard. Being the faithful British and Loyalist writer that he was, Smith was more a Thespian than a truth-sayer at times. The route for this jaunt he was taking was the timeline of the King’s Colony of New York and its important history, not the true and accurate history of this colonial setting. To review the kind of impact Smith’s work has had on US medical history, I performed a web search on 2/2/2011, for “William Smith” and “History of the Province of New-York”, 145 links were obtained using the Google search engine and 162 using the Yahoo! search engine. This of course represents a very low number of hits on a particular topic, probably due to the special history William Smith and his book by this complete name have in general in overall American history. But this was enough for me to perform some research with. The research question I asked was: who has plagiarized, borrowed from, paraphrased or otherwise made use of or cited Smith’s statement about Quackery in New York, and when they do why? This fairly controversial question came to me when I was reviewing the history of alternative medical professions for the colonial period and first half of the nineteenth century in the United States. What surprised me was just how many times William Smith’s book popped up in the hits for the search New York medical history, and the numerous key word combinations that I used. Smith’s writings came up so many times this got to be somewhat annoying. ‘Did getting these repetitive hits mean there was nothing new out there for this research question?’ This was a question I first asked myself back in 1983 when I began a specific line of research on “quackery”. It seems as though this question and hot topic in non-allopathic medicine has barely changed since. At some point during my review of some history of medicine writings, including “William Smith” and assorted secondary writers and more, I realized that this exact same quote kept appearing at various web sites or in the medical writings. Many of these sites/writings pertained to one or more important topics or periods in American pharmacy history. The key period that stood out in my mind, based on the publication years I kept seeing was 1906, the year of the Pure Food and Drug Act. So next I began thinking ‘Exactly who might be looking at Smith’s fairly old writings?’ Smith’s writings are so old in fact, that I took them to be more a specific piece of history related mostly to New York and the colonial years, not to any grander scheme of things in the medical research world. Now I was wondering, was this assumption wrong? Why are various special interest groups, all sorts of medical and non-medical professionals, and numerous types of general information sites citing Smith’s work? This became my research topic these next few days. 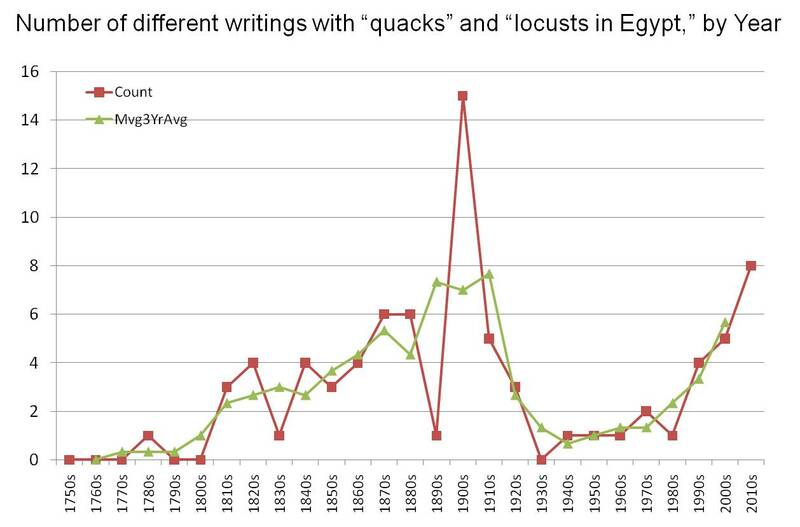 To start my search I typed in “Quacks” followed by “‘locusts in Egypt'” as a quoted phrase. Using just the Google Search engine this time, I got 73 hits. multiple citations for a single book in the form of a book review, of a recent medical history book pertaining to medicine and its related topics was considered just one hit. It is not unusual for a single book to have multiple distributors, each with one or more book reviews published, at times with reviews that either “stole” the “Quacks abound like locusts” phrase from Smith’s work (and interestingly, with and without citing the source of this phrase penned by the reviewer). books that are revised and republished fairly frequently, are cited either as first year, or as first year and last year if the time span between first and last is at least 15 years. repeated article titles are not cited separately, unless that article is reprinted by a totally different journal (libraries have a tendency to use completely different titles for the same older journals); since all items required manual inspection and reading, the chance for including the exact same journal twice in the final counts was eliminated. live sites representing a business are cited separately, unless it is overtly obvious the site performed some fort of “soft-plagiarism” by cutting and pasting from another web site. For example, the site which refers to a contemporary dictionary is counted, so long as that actual dictionary has not been already cited, or another site using the same information source, with same original copyright year for text used. live sites which serve a similar purpose, usually related to legal issues, but are different enough to be considered different enough to attract slightly different web readerships, were cited as separate web sites; for the most part, this pertained to a legal writing regarding Alternative medicine rights and legal definitions, all distinct sites with distinct audiences that requested the same permission rights from the same original author or publisher, and so state this on their web page. Personally authored sites are evaluated for text content and cited only once; an individual who places his/her item, such as a personally published book or article, in multiple sites (two different genealogy sites for example), is cited just once. The grouping of publication years was done in the following way: 1750s = 1750-9, 1760s = 1760-9, 1770s = 1770-9, etc. up to 2000s = 2000-2009, and 2010s = 2010-present. A three-year moving average was used to smoothen out the results slightly. As I suspected, my first point was true: Smith’s writings were most commonly cited in and around all forms of writings published just before and after the 1906 Food and Drug Act. My second point, also expected: the second peak is still developing for this now fairly common information source citation. The reasons for these two peaks are very different. Back in 1906, the issue was over-the-counter medications and medical labeling. Historically, the marketing of these agents has traditionally been the most common human behavior associated with quacksalvers, charlatans and mountebanks. The more recent peak in the citation of Smith’s work has more to do with the change in public attitudes about medicine rather than pharmacy, at both the clinical/professional and personal health care options levels. Legal issues still remain the focus during both of these peaks, only the topics have changed. The smaller peaks, although hard to denote as statistically significant, represent a growing interest in this topic. Pretty much all items cited before the internet years (pre-2000) are written materials. The content of those articles or books from the antebellum period focus on the political debate between regular physicians and alternative physicians. If the quacksalver or mountebank like scenario is referred to, it is either because this writing is a lengthy history of this topic, or is included as part of an example as to why further legislation needs to be passed. All items published before 1850, with the exception of one Eclectic Medical Journal article, are speeches and articles serving to promote regular medicine. Most items after the Civil War are also pro-allopathy, although note that this is about the time when Louis Pasteur’s and Joseph Lister’s discoveries were about to play an important role in medicine and surgery and ultimately infectious disease pathology. The 1880s and very few 1890s articles focus on both regular and alternative ideologies. Only two books or articles were found questioning the strong pro-allopathy climate that existed at this time, to such an extent that it was obvious the author was questioning some of the authenticity and correctness of this method of writing and drawing your conclusions in relation to the non-allopaths, as if they were that much different from allopaths. One of these authors felt allopathy had its questionable members as well was an international book on the history of medicine, published in Europe. The other was an author of an American publication. Since this to be just the Introduction, a list of these references will be published in short time, due to needs for proof-reading and review of completeness of citations. The context and accuracy of the quotes of Smith’s original text will be evaluated in the next review.